Odometer Statements: Federal Regulations require your new or used car dealership to state the mileage upon transfer of ownership of any vehicle sold by using a Vehicle Odometer Disclosure Statement that. All Estampe odometer statements are compliant with Federal Mileage Disclosure Laws. We also carry 3-Part Reynolds & Reynolds disclosure statements. These Odometer Statements will line up perfectly on any pre-programmed printer and will match your current forms. Vehicle Odometer Disclosure Statement: These Vehicle Odometer Disclosure Statements are 3-part carbonless. This Vehicle Odometer Disclosure Statement will line up perfectly on any pre-programmed printer and replace all competitor’s forms. Complies with all Federal Mileage Disclosure Laws. This is a Reynolds & Reynolds compatible Vehicle Odometer Disclosure Statement. Samples available for you to try on your equipment. 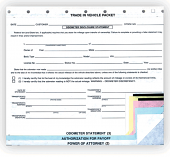 This 6-part Trade In Vehicle Form (packet) includes a 3-part Odometer Statement, Authorization For Payoff, and a Power Of Attorney all combined into one convenient form. This popular layout is revised with multi-color paper copies for distribution and high intensity carbon for clear copies on all parts. Use this trade-in-vehicle form to save time when working car deals. If the Trade In Vehicle Forms you're currently using looks like this one, it is compatible with your current program and should be totally interchangeable.